Businesses that provide cannabis products are growing as laws surrounding the sale, use and regulation of cannabis continue to change. As more parts of the world begin to legalize cannabis, its medical use has increased as individuals seek to find alternative treatment methods for a variety of health issues. The use of cannabidiol (CBD) oil has been used to treat issues such as anxiety, seizures, and chronic inflammation.New businesses are taking the opportunity to market these products to consumers. But the nature of the products causes financial institutions to view them as “high risk”. The following are 5 essentials to open a CBD merchant account. Establish your businessBanks and other financial institutions are more likely to provide accounts to established companies that have the financial standing to demonstrate the health of their businesses.CBD businesses should have an existing bank account prior to obtaining a CBD merchant account. Monthly volumeHigh-risk businesses often face high fees for accounts along with an unwillingness from banks and merchant account companies to provide the services they need to process payments.Your business must be a worthwhile investment for banks that feel they may be at risk when working with CBD merchants. The amount of business you do is a critical component that these institutions take into consideration.Most banks want to see at least $100,000 in transactions each month to minimize their risks. Minimize chargebacksChargebacks occur for a variety of reasons, and they can be costly to businesses and merchant account providers. Implementing strategies that reduce chargebacks helps you obtain the CBD merchant account you need.Your company’s chargeback frequency rate should be no more than 3 percent of your transactions. You should also have tools in place to prevent fraud and chargebacks. Have a strong processing historyThe longer you’ve been processing payments, the more likely you are to obtain a CBD merchant account. It’s recommended that CBD merchants have a processing history of at least six months.Your website should also include the products you offer and their prices. A complete website supports your processing history and helps you get a merchant account for your CBD business. Choose the right CBD merchant account providerThe number of merchant account providers can be limited for CBD businesses. Many have high fees or inadequate support while lacking the transparency that your business needs.Rolling reserves and fund holds are factors that you need to consider when choosing a merchant account provider. It’s important that you research account providers to ensure that you choose the right one for your business.CBD businesses need to be able to process credit card, ACH, and other payments. They need to have a reliable payment gateway that integrates with its existing website and online assets.Management systems for chargebacks and fraud are also essential to your success in the CBD industry. 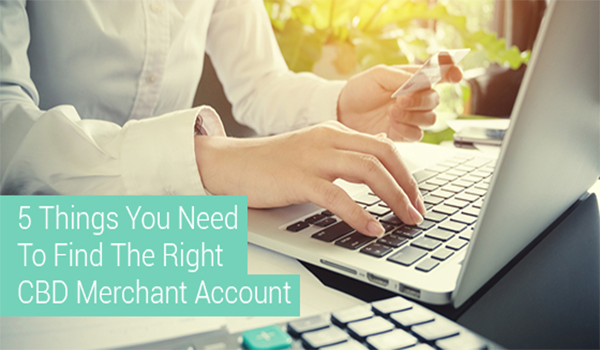 These 5 essentials to open a CBD merchant account will help you find the best provider who can meet all of your needs and provide the ongoing support to grow your business.